POPPY FUND DONATION TO THE HEALTH FOUNDATION. Comrade President Barry Whitehead had the great pleasure recently to make a presentation to Ross Fisher, CEO of the East Central Health Foundation. The presentation from the Yorkton Branch Poppy Fund was for $5000.00 and will be utilized for the purchase of new equipment for the Intensive Care Unit at the Yorkton Regional Hospital. Thank you to all who support and donate to the Branch Poppy Fund every year. The 2018 Poppy Campaign will be chaired this year by Comrade President Barry Whitehead. Barry has already started the in depth planning that is required to make each years Poppy Campaign so successful. To date the following dates have been established for Poppy Campaign and Remembrance Week activities. Dates and times for the following events will be published once they have been confirmed and approved by the committee. Campaign Flag Raising 5th Nov at 10AM at the RCMP flag pole. Remembrance Day Banquet There will be no banquet this year. As always volunteers are needed to assist with the Wreath Routes and other activities. If interested in helping out please call the office at 306-783-9789 and ask for Barry. Every year, for about two weeks prior to Remembrance Day—November 11th—The Royal Canadian Legion conducts the Poppy Campaign. The campaign is designed to raise funds for needy Canadian ex-service members and their dependents as well as Commonwealth veterans of World War II who may be eligible for assistance. Poppies are distributed for donations. This venerable symbol of Remembrance is provided for public or personal display as either a lapel poppy, or as included in wreaths, crosses and sprays which are laid at cenotaphs or other memorials at home and abroad. Donations are not mandatory and in some cases—as for example with school children—poppies are distributed solely to perpetuate the tradition of Remembrance among Canadians without any expectation of remuneration. The poppies distributed during the Poppy Campaign are intended to remind Canadians of the debt owed to the more than 117.000 Canadians who died in the military, Merchant Navy and Ferry Command services of Canada during two world wars, the Korean War and other theatres throughout the world. Donations received during the campaign are held in trust and, in accordance with the rules established for the trusts, are used throughout the year to assist needy veterans, ex-service members and their families. Former members of the Commonwealth and allied military services may also be eligible to receive benefits from these funds. Poppy emblems were first made in 1922 by disabled veterans under the sponsorship of the Department of Soldiers Civil Re-establishment. 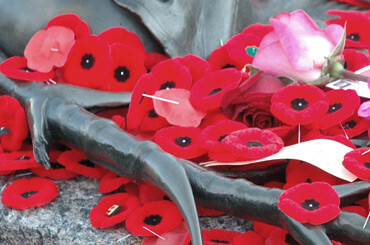 Until 1996, poppy material was made at sheltered workshops run by Veterans Affairs Canada in Montreal and Toronto. The work provided a small source of income for disabled ex-service persons and their dependants, allowing them to take an active part in maintaining the tradition of Remembrance. That mandate has now ended and the manufacturing is being done by a private company. During the Poppy Campaign some 18 million poppies and 70,000 wreaths, crosses and sprays are distributed across Canada and overseas annually. 0peration of the Dominion Command Service Bureau. A gernade thrown into a kitchen in France would result in Linoleum Blownapart.